A few weeks ago, I did something a little crazy. 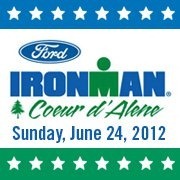 In approximately 9 months, I’ll be racing Ironman Coeur d’Alene (aka IMSpud). I’m uber super excited and (what I feel is an appropriate level of) nervous. But most of all, I’ve been praying one thing over and over: Please dear Lord, let the water temps be at least 65*. Since I left you last a few months ago (with chocolate cake, no less), I’ve been doing a whole lot of swim-bike-run and a lot of eating. The more I train, the more I eat, but because the more I train leaves me with less waking moments spent NOT training, the less made-by-me food I consume. Thus the lack of posts. Yesterday, as I was trudging up the last hill on the (rather hilly) course of the Red River Rally up in Sherman (which is my idea of the perfect “small” Texas town), I thought about that conundrum. Since I spend a good chunk of my “free” time torturing myself training, I consequently spend a lot of time eating out these days – something I never thought possible when I first went GF. And most of the emails I receive via this blog are about where to eat out in Dallas. By the time I’d reached the top of that stupid hill, I had an idea for a series: Dining (out) in Dallas. My plan is to create a repertoire of restaurant reviews – of the chain and non-chain variety – that will serve as a dining guide for those visiting Dallas and hoping to eat out safely. Oh, and you know, give myself more excuses to not lift a finger in the kitchen. Enjoy! And I promise I’ll be checking in more, especially as Ironman training officially begins. Until then, I have a half-iron race in OKC in September (Redman) that gets my total focus! Thanks Erica! Congrats again on baby Kaylin! congrats – that’s so exciting!! !